EARL EDWARD McKINNEY was born 8 Sep 1895 at Hailey, Fremont County, Wyoming & was raised on the Upper Graham ranch in the Myersville District of the Sweetwater River country of Fremont County. His parents, EDWARD & NORA (GAYLOR) McKINNEY, leased this ranch from close family friend James Graham who became a partner in the ranching activities. 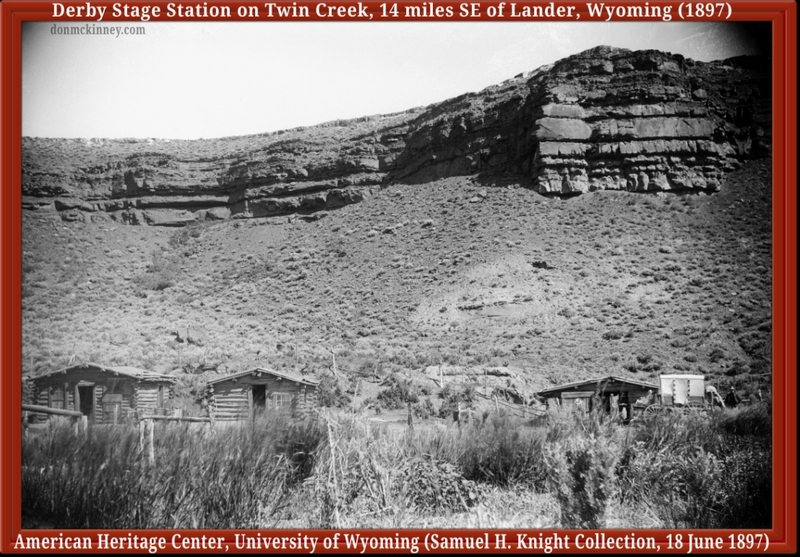 In 1910, his parents purchased a ranch in the Borner's Garden area of Sinks Canyon near Lander, Wyoming. After Earl's marriage in 1913 to Amelia "Dottie" Farthing, who was also from the Sinks Canyon area, he continued a partnership with his father and ran horses & cattle on the open ranges of the Sweetwater River and Beaver Creek. Earl & Dottie had 3 children, Lenore, born 1915, Edward, born 1917 & Donald, born 1920. Earl and his family moved to southern California in 1923 when his parents and other family members moved there, but moved his family back to Wyoming the next year. Earl later leased and operated several ranches over the years and had a mountain homestead in Sawmill Basin. 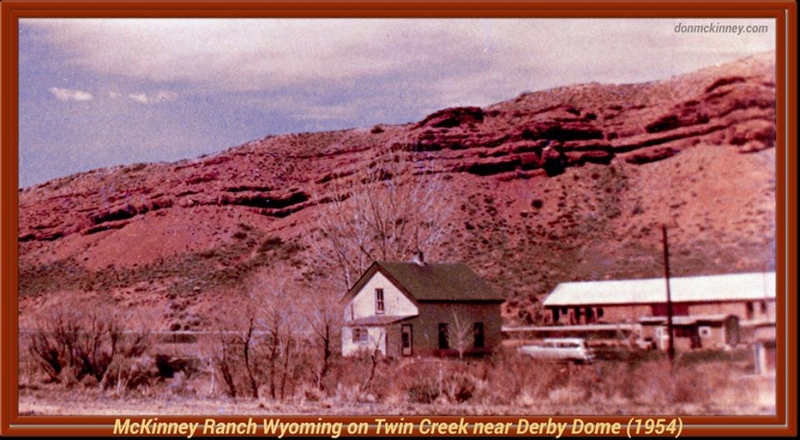 In 1949, Earl & Dottie purchased a ranch on Twin Creek at Derby Dome 14 miles southeast of Lander, Wyoming. They had leased this ranch for several years before purchasing it. Their son Edward & his wife Hilda became partners in the daily operation of the ranch & raised their children there. Earl resided at this ranch until his death 5 April 1974 and was buried in Mount Hope Cemetery in Lander. AMELIA GRACE "DOTTIE" FARTHING was born 16 Dec 1892 & was raised on a farm in Sinks Canyon near Lander, Fremont County, Wyoming where her father farmed and practiced horticulture. Dottie's parents were EDWARD & ELIZA (KIMBER) FARTHING who immigrated to this country from the Isle of Wight, England during the 1870's. After settling briefly in Salt Lake City, Utah, they traveled to Fremont County, Wyoming in 1881 in a covered wagon along with a wagon train of other families. Her father was also a carpenter & painter and built several of the old homes and buildings in Lander. After Dottie married Earl McKinney in 1918, they operated several ranches until they purchased the one on Twin Creek. She was an active member of the Episcopalian church and local garden club. After her husband died in 1974, she continued to live on the ranch with her son Edward McKinney & family, until her own death 19 Feb 1976. She was buried beside her husband in Mount Hope Cemetery. Grandparents Earl & Amelia "Dottie" (Farthing) McKinney first leased our �ancestral ranch� in 1940-1941 from Francis & Ellen (Carmody) Savage. It is nestled between magestic red cliffs to the north & big red Gobbler�s Knob to the south. Prior to 1940, during the entire decade of 1930's, they leased the Scott place ("Dry Lake") near Dallas & various other places from 1913 through 1920's where they raised their children Lenore, Edward & Donald (our father). Lenore married Bert Hambrick in 1934 & never resided with her parents on the Twin Creek ranch. During the early 1940's, Lenore & Bert leased the Scott place ("Dry Lake") near Dallas where she resided as a child but they eventually moved to Missoula, Montana where they raised their children, Barbara, Donnie & Steve Hambrick. Our father Donald resided with his parents at the Scott place & briefly on the Twin Creek ranch when they were leasing it in 1940-1941 & also when they moved to the Mackey place later in 1941. He left Wyoming in October 1941 when he joined the Army. Donald became a career Army man & met our mother Eda Faye "Tommie" Thomasson (from Arkansas) who was in the WAACS at Fort Riley, Kansas. They were married in 1943 & raised their 2 sons Donnie & Richard McKinney on various military installations until retirement in Junction City, Kansas in 1962. Earl & Dottie's son Edward married Hilda Iiams in 1938 & they settled on the Scott place with his parents & also moved with them to the Twin Creek ranch in 1940. Anyway, later in 1941, Earl & Dottie left Twin Creek & leased a ranch from Herb Mackey at the junction of highway 28 (road to South Pass) & hiway 287 (road to Lander). They resided there for several years before moving back to Twin creek & leasing it again about 1946. Their son Edward & Hilda came with them to both places & daughter Marilynn was born in 1941 when they resided on the Mackey place. Ed & Hilda raised their children Marilynn, Tim & Kelly McKinney on the Twin Creek place. 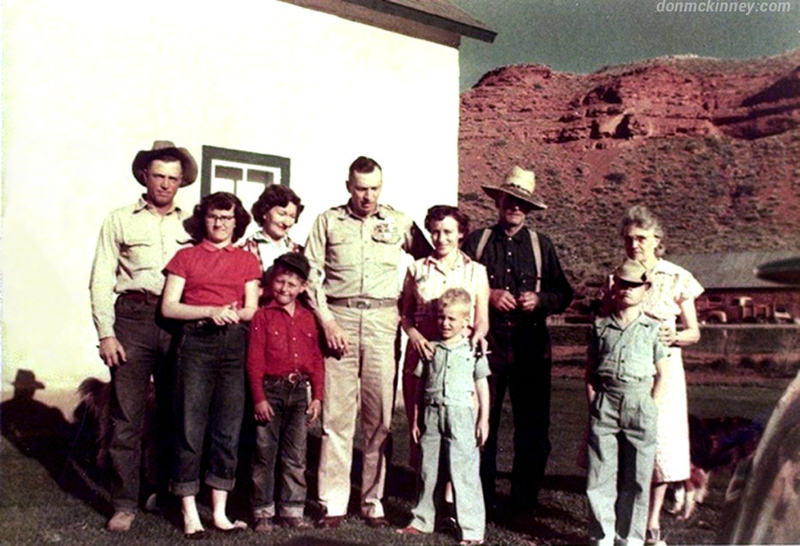 Grandfather Earl eventually purchased the ranch by �Executor�s Deed� on 12 September 1949. This deed included the main old �Carmody Place� near Derby Dome on Twin Creek along with the �Kurtz� & �Sharp� places, all once owned by John Carmody & later inherited by his only child Ellen Savage & other heirs. Dad's first cousin, the late Jim Farthing, sent me these deeds years ago when he was County Clerk. He could not find anyone named "Sharp" who had a deed to the "Sharp place" part of the ranch, across the highway to the northwest. We believe it was named for someone who leased or lived there at one time. John Carmody left Ithaca NY during the early 1880's & settled in Wyoming. He established a large cattle & sheep operation throughout various areas of Fremont County, with several partners. Coincidentally, John Carmody worked with Earl's father Ed McKinney on the "71 Outfit" during the 1880's and he & wife Jennie Pollard were witnesses when Ed McKinney married Earl's mother Lenora "Nora" Gaylor in 1893. The "Kurtz place" was originally owned by David Paul Kurtz who died in 1924. According to Mary Hancock in her book "Sheep Trails & History Tales", he was killed by a horse in his barn near the Kurtz corrals.. His widow Laura and 2 daughters Eva & Betty Jane moved to another area. John Carmody evidently gained ownership of that place before his death in 1931. The "Kurtz place" corrals southwest of the main ranch at Derby Dome are still used for branding calves. According to grandad Earl's 1949 deed, he purchased the ranch from the estate of "Christina Thornton" of Berkeley, Alameda County, California. Evidently, the family & other Carmody heirs transferred the ranch to this unmarried lady during the early 1940's. 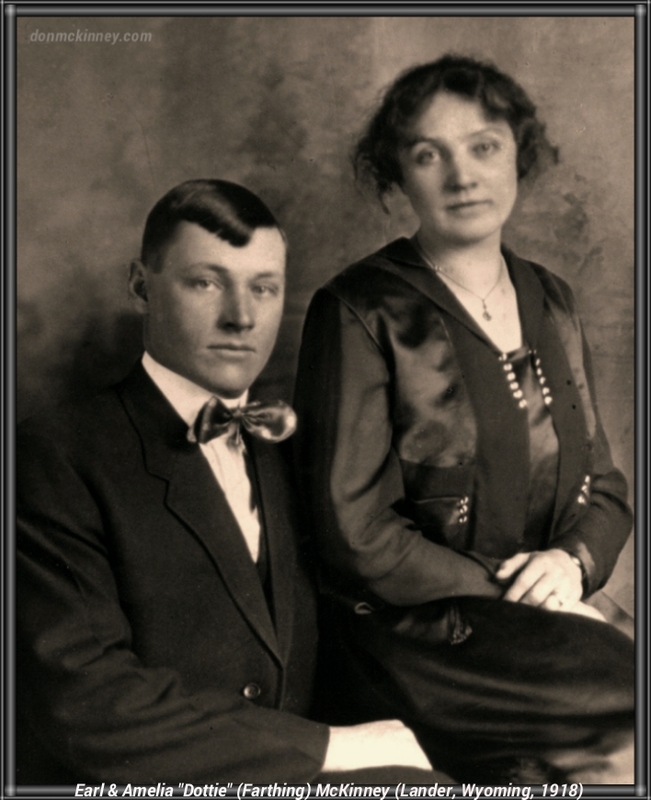 Her connection to the Carmody family is unknown, however, John Carmody's younger sister, Annie Carmody Ivens resided in Berkely, California from 1920's untii her death in 1939. Originally, Annie left Ithaca, NY during the 1890's & joined her brother in Wyoming. She married a business partner of her brother, John P. Ivens who died in 1902. Annie & their son John Francis Ivens, moved to Berkeley, California about 1920. Evidently, the Title research for grandad Earl's 1949 transaction indicated some unresolved actions concerning several individuals who were somehow legally associated with this ranch from the early 1900's through 1940s. Grandad Earl & A. W. White, executor of Christina Thornton's estate, were required by law to file a "technical lawsuit" to gain a "clear title" for the purchase of this ranch. According to legal procedures, the Sheriff made every effort to contact the other individuals (see below) & notices were published in the newspaper. The only individuals who were still in the area in 1950 & successfully contacted were Ellen & Francis Savage & their daughter Mary Nowlin. No challenges or objections were made & the court confirmed on 20 Feb 1950 by legal decree that grandad Earl McKinney's "Executive Deed" purchase was valid. The main two story ranch house where Earl & Dottie McKinney resided was originally log & was one of the first houses built in that area, probably by John Bircumshaw, from Derbyshire England, who was the original homesteader during the mid 1880's. Post office records referenced by "Annals of Wyoming" indicate the "Derby Post Office" was established on May 5, 1888 with John Bircumshaw as postmaster. It was discontinued on March 16, 1895 and its mail then handled by the "Dallas Post Office" about 5 miles north on that Rawlins to Lander Stage Road. 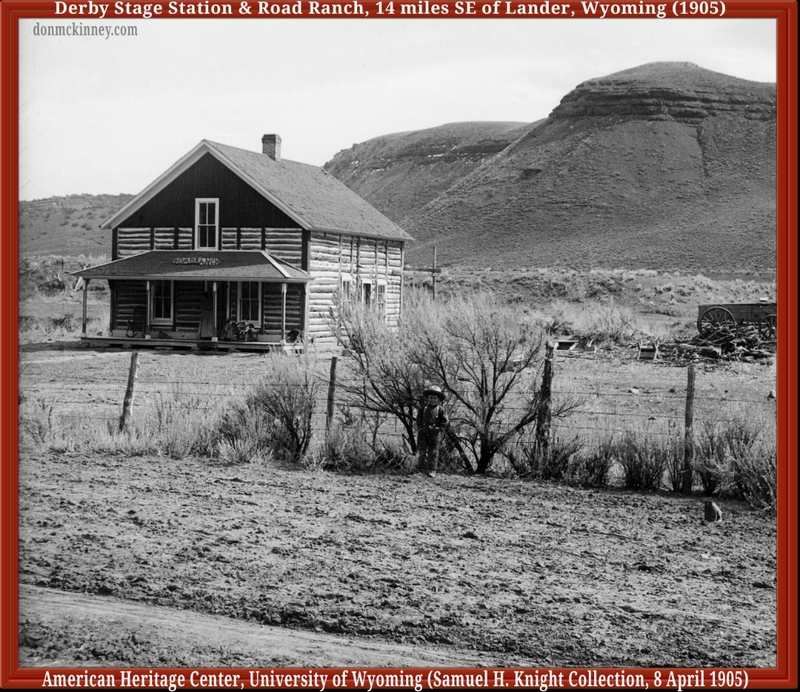 The 2 story log house served as the �Derby Road Ranch� for travelers during the stage coach era & 3 log cabins across the stage road, under the red cliffs to the north, served as the stage stop, livery & residence for the stage keeper. 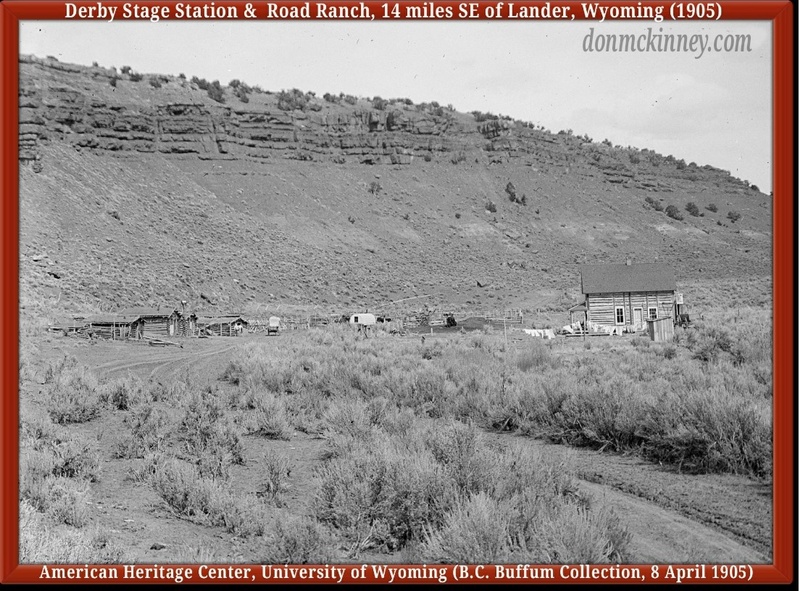 John Carmody purchased the ranch about 1905 & possibly remodeled the 2 story log "Road Ranch". He also replaced the 3 log cabins on the north side of the road with a long stage stop building from red rocks retrieved from the cliffs. At the same time, he built a large red rock barn on the south side of the stage road & east of the 2 story log "Road Ranch". John Carmody used the ranch as one of his sheep headquarters. After his death in 1931, his daughter Ellen & husband Francis Savage continued to use this ranch as a sheep headquarters during the decade of the 1930's & early 1940's. Grandfather Earl McKinney raised hereford cattle when he leased this place from the Savages during the 1940's & after he purchased it. A couple of years after his 1949 purchase, he used white stucco to cover the logs of that original 2 story ranch house & later purchased the adjoining �Rasmussen Place� to the west on onion flats. Their son, Edward and Hilda, became partners in the day to day operation of the ranch & about 1946 brought in a nearby small brown 2 room style house from the oil company, the former Twin creek/Derby school house that was discontinued during the early 1940's . Ed & Hilda used this as their residence until they replaced it 1956-1957 with a larger one story white house they brought in from the oil company that was also located nearby to the east, in an area just north of the "old highway" . As previously mentioned, Ed & Hilda raised their children, Marilynn, Tim & Kelly on this ranch. In 1957, Earl & Dottie's historic ranch house was destroyed by fire & was replaced with a large trailer house. Grandad Earl used the I reverse Z brand on his horses & cattle while Edward used the D Mill Iron brand that he received from his uncle Lloyd McKinney. Edward also worked off and on for the oil companies and did backhoe and bulldozer work to supplement the ranch income. They used the old red rock stage stop across the highway to store their tractors & heavy equipment. About 1970/71, when the highway was rerouted & rebuilt farther north, this red rock building was demolished. Shortly before grandparents Earl & Dottie died during the mid 1970's, they deeded the ranch to son Edward & Hilda. Edward inherited the "Rasmussen" part of the ranch on onion flats when grandmother Dottie died in 1976. Edward & Hilda's son Tim & Rosanne McKinney are the current owners. Cousin Tim, a retired Fremont County sheriff, recently built a new home to replace their home that was destroyed by fire in 2013. It was built in the same location a couple of miles south of the original main ranch & red rock barn that are near the highway. They also lost youngest son Todd in January 2013 of a heart attack who also resided on the ranch. Their oldest son Tim Jr & family reside near Pinedale. Their daughter Tara Berg & husband Brett built a house on the "Sharp place" part of the ranch, across the highway to the northwest of the original main ranch & red rock barn. They reside there with young daughters Brooke & Brittnee & they all participate in the daily ranch work & various ranch activities. My brother Richard & I have many fond memories of our wonderful "ancestral ranch" during visits going back over 60 years. Many more visits to come & the ranch is still in good hands, keeping the ranching tradition of our family alive & well.